Maintaining roof-support integrity is essential in any mine. E&MJ looks at today’s support options from the expert supplier’s viewpoint. Rock support, a critical area of mining practice, will gain further importance as mines get deeper with higher rock stresses. Support systems that provided adequate protection in the past will need to be modified and upgraded in order to fulfil their future role, with new combinations of technologies required to satisfy safety demands. As an example, rockbolting practice has developed markedly over time, with current systems giving greater protection while requiring less labor for installation. Similarly, shotcrete support is becoming increasingly mainstream, especially in areas of a mine that are likely to remain in use for a long time—such as crusher chambers—or will be subjected to heavy wear, a case in point being drawpoints in a block-caving operation. Rockbolting concepts have also been extended to include cable bolts, once the exclusive domain of major civil engineering projects such as caverns but now increasingly becoming commonplace as an in-depth support method for, say, a weak hangingwall in open stoping or cut-and-fill mining. Mesh screen is also much more widely used than before, acting as a catch-all for spalling rock and as reinforcement for shotcrete. However, the major disadvantage here is that mesh is time-consuming, and hence expensive, to install properly, as well as being awkward to handle. One potential answer seems to be thin, sprayed-on membranes which, while still at a relatively early stage along the acceptance path—in hard rock mining, at least—can provide an equivalent capability in terms of spall protection, yet at significantly lower labor input. Rather than looking once again at the various systems that are currently on offer in technical terms, E&MJ asked some of the world’s leading suppliers of rockbolts, shotcreting admixtures and TSL membranes for their views on how these systems have been developed in recent years, where they are heading, and what challenges are on the horizon for ground control in mining. Here are some of their responses. E&MJ asked what major advances have been achieved in ground-control technology in hard rock mining over the past 10 to 15 years. According to Lars Hage, technical manager for sprayed concrete at the Switzerland-based producer of construction and mining concrete admixtures, BASF, the first and foremost point is that there has been a vast improvement in the attitude and approach to safety in underground environments. The biggest advance in terms of ground control technology, he said, has been the move from dry- to wet-mix sprayed concrete, with developments in the concrete industry meaning that it is now possible to produce wet-mix sprayed concrete with compressive strengths of more than 60 MPa at 28 days. Hage went on to explain that the advent of modern admixtures applied to wet-mix sprayed concrete has reduced problems such as high rebound and dust levels, poor compaction and loss of structural performance significantly, by enabling the placed concrete to be initially plastic in nature. It has also increased output capacity considerably, he added. The introduction of alkali-free set accelerators in particular has allowed for long-term durability in both rock support and tunnel linings, as well as providing an environmentally friendly and non-caustic solution, as opposed to their predecessors, sodium silicate and aluminate. Furthermore, the addition of steel or synthetic fibers to the sprayed concrete mix has led to improved flexural and shear toughness, and resistance to impact. This is particularly the case in areas of high deformation, or where crack control is needed. New advances in spraying manipulators have made the task of setting the optimal nozzle angle and distance even easier, thanks to technology that automatically controls the spraying distance, speed and angle of the spraying jet to the surface. 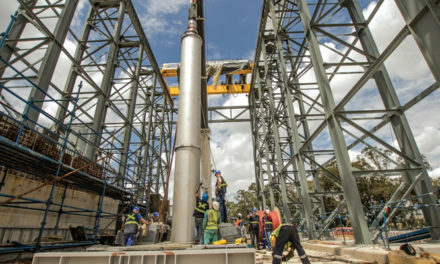 “The mechanization of all procedures that has taken place in the mining industry in the last 20 years has gone hand-in-hand with the development of sprayed-concrete technology, leading to higher and more efficient output,” Hage said. From the perspective of a major international rockbolting systems supplier, with its North American headquarters in Utah, Dywidag Systems International (DSI) made reference to the U.S. hard rock market. Here, it said, major advances have included the utilization of inflatable expansion bolts and cable-bolt technologies, along with coordinated FLAC and other ground control/geologic analysis methods. These have helped to improve the overall system of supports, with other ground-control stabilization technologies working as a system. 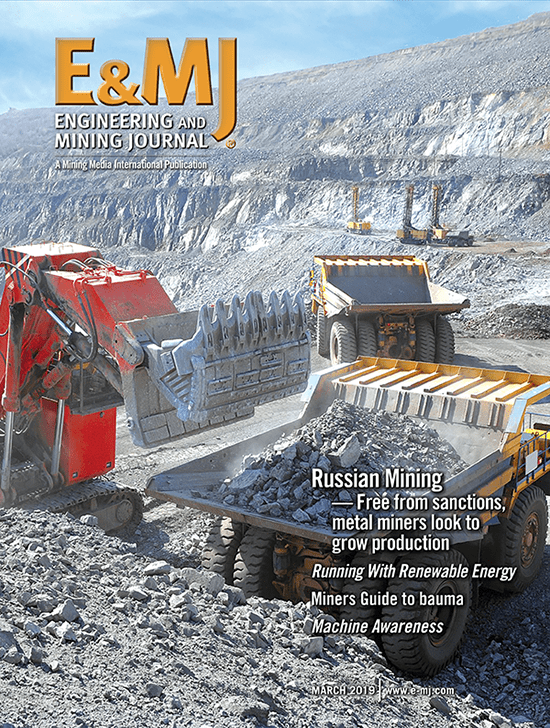 With reference to Thin Spray-on Liner (TSL) technology, Rob Hawker, technology manager at Minova in Australia, told E&MJ that no TSL has yet been successfully implemented as a mesh-replacement system for in-cycle use in hard rock mines. The company’s principal product in this area, the cement modified polymer Tekflex, has been widely used in coal applications to help control rock degradation through scaling, spalling and weathering, providing a flexible, high tensile-strength lining that can accommodate stresses associated with rock movement as well as acting as a barrier to moisture degradation. Most of the development work Minova has undertaken over this period has been focused on improving its current range for special applications such as escape-shaft liners or preventing weathering, Hawker added. Looking ahead, he said the company has continued to invest in TSL research and has several new systems that it hopes to commercialize within the next two years. These systems are focused on improving the cure times and the application process, he said. While Minova’s focus has been on cement-based TSLs, Canadian company Spray On Plastics has developed a two-part polyurea product, RockWeb. Technical specialist Tyler Macpherson’s view is that the biggest advance in TSL technology has been the ability to use liquid RHSF (reactive, high-strength, flexible) TSLs to cover irregular or broken surfaces. These systems provide the absolute highest tensile strengths available, he stated, can cure without the need for, or interference from moisture, and develop their strength much faster than other types of systems—in hours compared with days. “Most significant is the webbing technology that allows us to do this,” he added. “We have also done considerable equipment development that has made application quick and easy, and we have created bonding systems for excellent adhesion to rock and concrete. We have also developed state-of-the-art equipment that makes mobilization fast and simple: no different from hooking up a drill jumbo or bolter,” Macpherson said. DSI North America claims leadership in inflatable expansion bolt and coating technologies, and is working on expanding further the ground conditions for which inflatable expansion bolts can be used. The company told E&MJ it has also developed a major role in the supply of hard rock cable-bolt and resin technologies, while its engineering staff has extensive experience in helping its customers with geologic analysis and product development. BASF’s Hage noted that the company has made significant contributions in advancing ground-support technology, with a comprehensive range of chemicals and equipment for wet-mix sprayed concrete in particular. Its R&D team is continuing to develop solutions through expertise in cement chemistry, concrete technology and material science, he added. In practice, of course, ground-support systems are only as good as the standard of installation or application. A poorly designed support system will not perform well in the long term, and may not even address immediate safety issues such as spalling where the surrounding rock mass has been damaged during excavation, or where inherent geotechnical features bring the potential for localized failures. Such concerns have led to the increased use of shotcrete and mesh, with roofbolts providing the compressive arch needed for durable self-support. E&MJ asked each of the respondents what challenges they see in installing modern roof-support systems, and how these can be overcome. DSI: All underground mining operations see ground control as a major expense, so partnering with DSI allows the operator to have a business partner with industry-leading expertise, innovative products, and superior service and support with experienced professionals. These elements are strategic to allow underground mining and tunnelling operations to be safe and productive. With mines getting deeper, rock conditions will inevitably become more challenging. E&MJ sought the respondents’ views on the key areas of ground-control technology that they envisage will be able to help mining companies operate safely at greater depths. He went on to quote one of his colleagues, Warren Mahoney, market manager for ground support at BASF Australia. “Faster setting sprayed concrete accelerators in the initial 1- to 2-hour period after spraying, and real-time thickness control during the application of sprayed concrete will help mining. More consideration should also be given to the use of resin injection for very badly fractured ground. This technology has an extremely fast setting time for bonding strata with minimal downtime,” Mahoney said. Macpherson: “Generally, operations interested in using RockWeb are experiencing unravelling ground or high convergence. Though it cannot stop the convergence (due to its flexibility) when applied underneath a stiffer support like bolts and screen, the unravelling of broken ground can be reduced as the smaller pieces cannot be dislodged from between key blocks.” He added that while this can also be achieved using shotcrete, shotcrete tends to break in squeezing ground, allowing the unravelling to continue. Macpherson went on to look at logistics issues. “As mining operations reach greater and greater depths, the challenges of moving materials like shotcrete increase. RockWeb was used in a cone sump application at a depth of 9,300 feet because the mine was unable to move shotcrete to the level via two shafts fast enough to complete the job economically or on time. The RockWeb materials and equipment were sent to the level in two cage runs,” he said. DSI: DSI has been engaged in the development of a full dynamic bolting product line for the past three years. These products include dynamic steel bolts/resin assist, dynamic cable/resin assist, and dynamic mesh that have all been tested and rated. This work has been completed in Canada and Australia to prepare products that will allow mining companies to work safely and productively at greater depths. Each of the respondents also addressed the ever-present question of finding sufficient skilled labor to install their systems safely and effectively. From Minova’s perspective, Harker told E&MJ that the company does not just focus on the development of products, but has a systems approach to development. “With this in mind, we aim to provide the tools needed for ease of installation, regardless of labor force skills,” he said. Training is clearly critical here, and DSI pointed out that it purposely hires experienced mining professionals to aid its customer base with ground-control installation training issues. Its engineering and R&D staff work closely with its customers to design products and systems that are ‘miner-friendly’ for installation and usage, the company added. With TSL technology being developed as an alternative, or add-on, to shotcreting, E&MJ asked the three companies involved in this area for some ideas on how the costs and long-term durability of the two systems compare. What becomes clear from this discussion is that in the future, deeper mines will become increasingly reliant on a combination of techniques for their ground-support needs. Each of the systems outlined here has its own place, strengths and shortcomings. 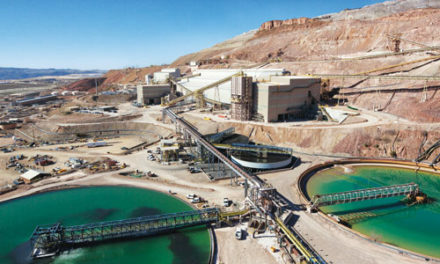 With rock conditions varying from heading to heading, as well as from level to level, mines will need to make site-specific choices; there is no ‘one-size-fits-all’ answer when personnel safety is involved. Rockbolting in one of its many forms will doubtlessly continue to form the front line, either alone or together with meshing. Cable-bolting extends this capability deeper into the rock mass. Shotcreting—either plain or reinforced—requires a better-developed delivery infrastructure, but offers long-term stability so long as ground movements are limited in extent. TSLs are quick to install and offer good spall resistance, but do not have the shotcrete’s structural capacity. Each operation must find its own optimum support solution. Wire mesh has long been used to provide coverage of roofs and sidewalls, catching spalled rock before it falls and—if it is installed correctly and pinned in place with rockbolts—providing additional support to the rock mass. However, as anyone will know, who has ever had the challenge of handling it, and trying to ensure that the mesh conforms closely to the rock surface, it is not the world’s easiest material to work with. As a result, all too often the job is not done properly, and the support provided is not as good as it could be. Improved accuracy and speed of installation are just two of the benefits to be gained by using a synthetic support grid instead of wire mesh, which can be heavy and unyielding, says U.S.-based Convenience Products. The company has teamed up with Tensar International Corp., manufacturer of TriAx TX Geogrid, an extruded and stretched polymeric grid that can be used in roof and sidewall installations. What was needed, however, was a method of holding the grid in its rolled configuration with just the right amount of resistance to allow it to be pulled apart when the roll was unwound during installation, according to Steffenino, who approached Convenience Products to see if its Touch ‘n Seal Mine Foam would provide an answer. This led to the development of a patent-pending process known as ‘resistive unrolling,’ the companies report. 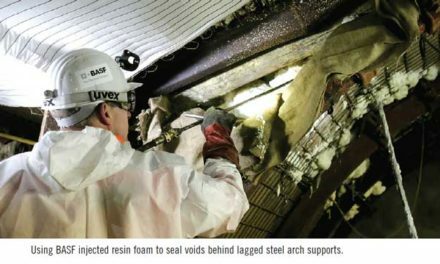 The Mine Foam is strong enough to prevent rolls of grid material from unwinding under their own weight, yet allows them to be pulled apart in a controlled manner while keeping the remainder of the roll intact. DSI has a long history in ground control and is among the leading ground-control systems providers in Australia and North America. In the U.S. market, DSI Underground Systems claims to be the leader in hard rock product sales, with a range that includes steel, resin, cables, composites, standing steel supports, backfills and other widely used ground-control methods. BASF has a strong foundation in concrete technology, and was one of the early proponents of sprayed concrete. Through collaboration with the mining industry, this is now widely accepted as a very successful means of ground support. 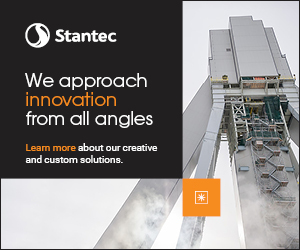 The company’s ground-consolidation interests today encompass the injection of fractured strata, cavity filling, water-ingress control, and supplying high-performance grouts for rock anchors. Minova’s TSL range consists of two product types. The traditional Tekflex type is a flexible TSL system that is available as either a two-component liquid/powder or a single component dry-sprayed version. The second type, Capcem, is a rigid TSL material that is extensively used for rock weathering protection in South African mines. Spray On Plastics, with 20 years’ experience in the development of TSLs, has patented what it claims is a unique way of spraying polyurea coatings by creating polymer strings or ‘webs.’ It says that these plastic fibers reach and stretch around obstructions before melting back together to form a resilient structural membrane. It now has two RockWeb products, one for general areas like drifts and pillars, and the other designed for remote spraying in large boreholes—developed as an emergency support system for the Chilean mine rescue in 2010 in the event of unravelling in the boreholes.